The gas tank that has dominated the skyline for years will be totally removed by the end of the week. It then begins its new life. First off to York for refurbishment then reinstalled on the other side of the canal as part of the new development. It will sit alongside two other gas tanks that will have exclusive apartments built inside them. Love the fact that there is a labourer and the office worker in his snazzy coat walking past. Gives it a nice contrast. Glad something is being done with them. Geez, I hope they give them a good clean! Gas tanks into luxury apartments?? How interesting. To live in a gas tank? Strange. Well, that's certainly an interesting way to recycle...I don't know that I would want to live in an old gas tank though! Does this mean gasometers are at last being appreciated? I admire them - their size, their shape, their movement, their rust yet it's always been considered a disadvantage to live near one. As for living in one - I suppose it's clever, amusing and saves them. I suppose we'll get used to them being changed this way. In the meantime it seems a bit demeaning - for the structure (not the people). I love that London has caught on to the "warehouse living" idea that took New York by storm. I've seen some great developments inside old churches but, of course, I wish the churches remained. Or at least their crumbling down old ruins. 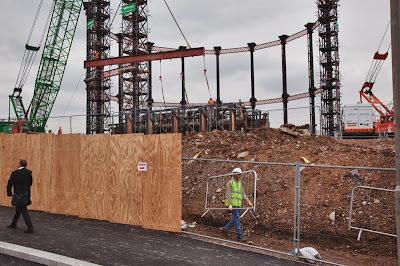 The gasometer in the image is actually being redeveloped by BellPhillips architects http://www.bellphillips.com/ as a public space a ground level, and an events space below. 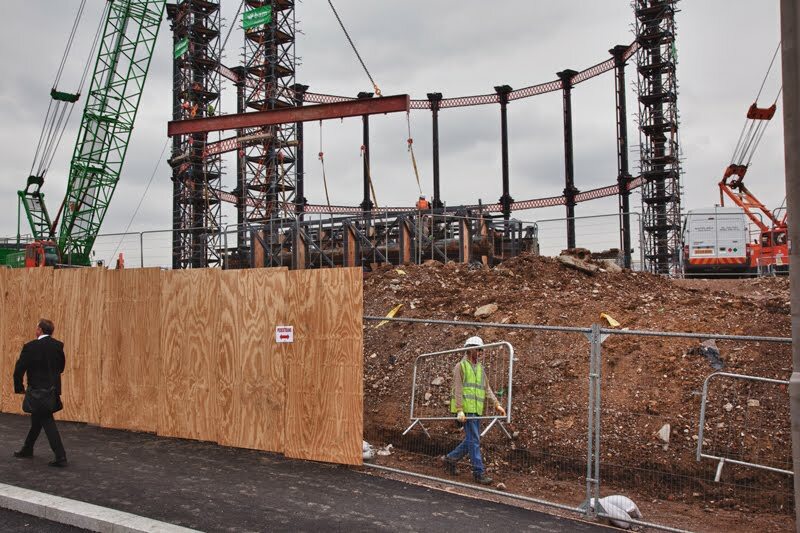 The "Triplets" are going to be luxury housing, but they are larger versions of Gasholder No. 8.